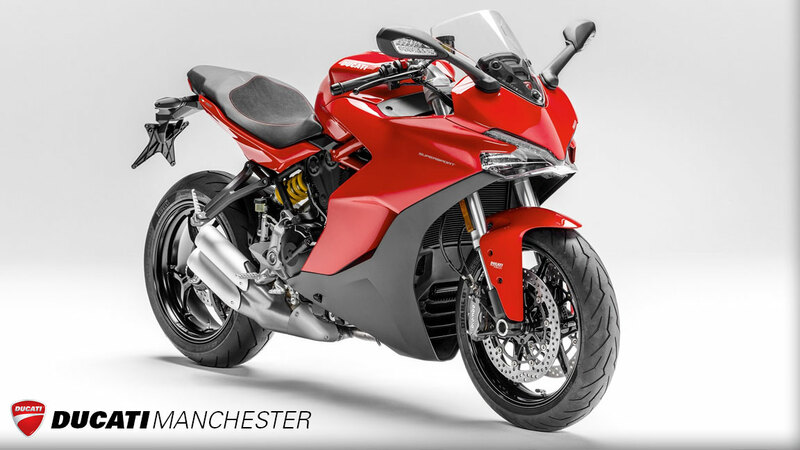 Contact Ducati Manchester for full details and offers on the new SuperSport. The SuperSport is the perfect sport bike for the every day roads. It's designed for the everyday roads having in mind the track, to transform every riding occasion into a personal track-day session. The SuperSport makes any rider a sport rider, anytime and anywhere. A front-on look shows it has a distinct 'family feel' with the Panigale superbike. 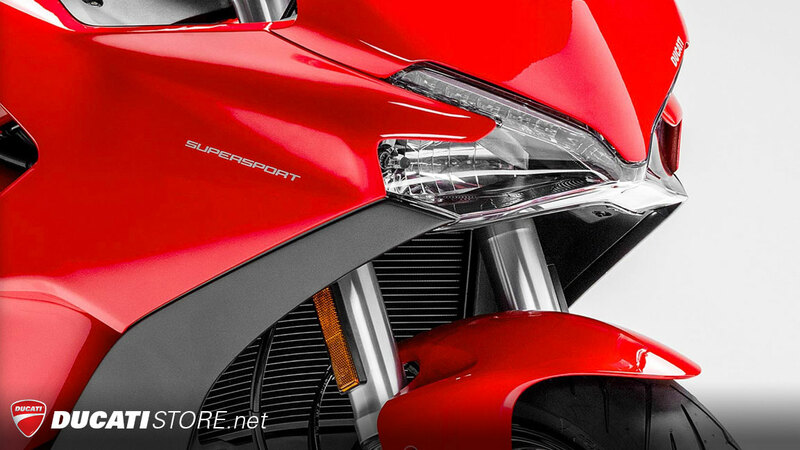 In addition to the highly distinctive LED Daytime Running Light (DRL), the headlight's low and high beam parabolas are positioned in the shadows of the assembly, almost hiding them from direct frontal view: just like those mounted on the top Ducati sports models. Ducati's conscientious attention to technical components is also seen in the compact, sports-style stacked dual-pipe side muffler. Shaping and low-slung design bring out the dynamism of the tail, leaving the rear wheel Y-spokes in clear view and providing plenty of room for side panniers (available as accessories). The single seat, the rider and passenger areas of which are outlined by contrasting stitching and just a hint of rider "backrest", is comfortable for daily use yet also highly suited to sports riding. 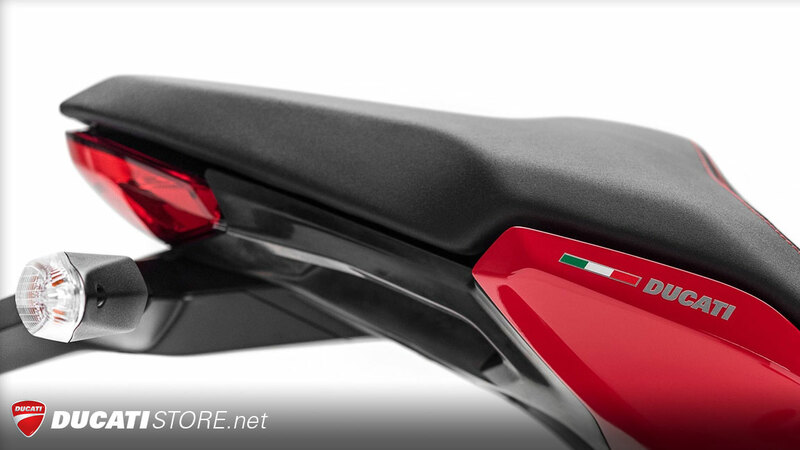 Seen from above, the tank and nose fairing form, together with seat shaping, that unmistakeable silhouette shared by all the sportiest Ducatis. The SuperSport is powered by a specially adapted version of the already renowned and appreciated 937 cm3 twin-cylinder Ducati Testastretta 11°. Euro 4-rated, it has four valves per cylinder, a secondary air system, liquid cooling, a 12.6:1 compression ratio and bore and stroke measurements of 94 and 67.5 mm respectively. Engine output amounts to a huge 113 hp at 9, 000 rpm and a maximum torque of 96.7 Nm at 6,500 rpm. 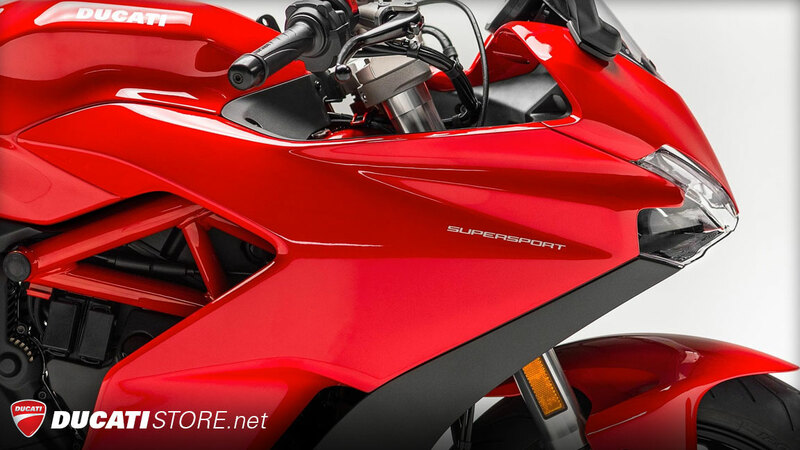 Contact us today to book a test ride or latest special offers on Ducati SuperSport Models. At 3,000 rpm, some 80% of maximum torque is already at the rider's fingertips: higher revs are met with a decisive, linear increase in torque, peaking at 96.7 Nm at 6,500 rpm. Beyond that threshold the torque curve slopes down gradually yet still remains above 90% with the revs at 9,000 rpm; the maximum power of 113 hp is delivered at around the same point, at 9.000 rpm. On the road, the Testastretta 11° guarantees plenty of power throughout the rev range, meaning whip-like acceleration out of the corners, fewer gear changes and unparalleled riding enjoyment. Even on the road, riders can make full use of the bike's 113 hp as the engine gives the reassuring sensation of total vehicle control. Taking into account the likely usage of the SuperSport, engine control and injection systems have been tweaked to make the most of the twin-cylinder's innate characteristics. Electronic throttle control ensures precise transmission of the rider's wrist action to the engine; there follows a smooth, always-certain response that perfectly matches the SuperSport's immense versatility. In developing the SuperSport, attention has been paid not only to achieve top level performance but also to ensure both rider and passengers a high level of safety in all driving conditions. 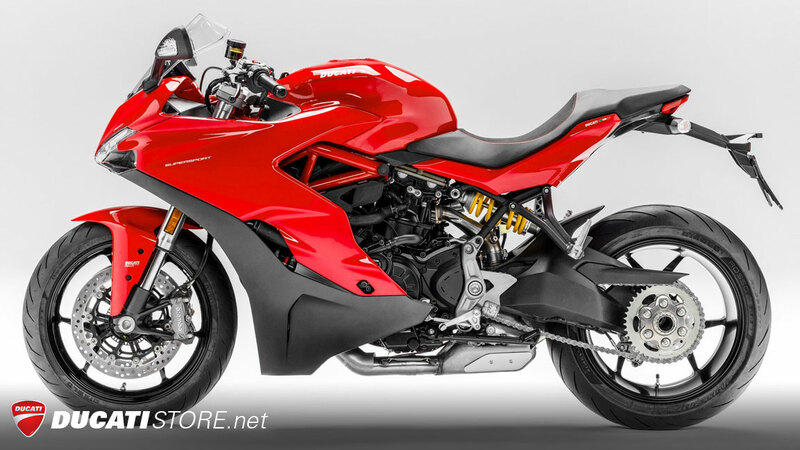 This second goal has been achieved by equipping the SuperSport with the Ducati Safety Pack (DSP), which comes standard along with the 9MP ABS system and the 8-level Ducati Traction Control (DTC). Thanks to a comprehensive range of versatility-enhancing accessories, the SuperSport is ready to respond to riders' individual needs. 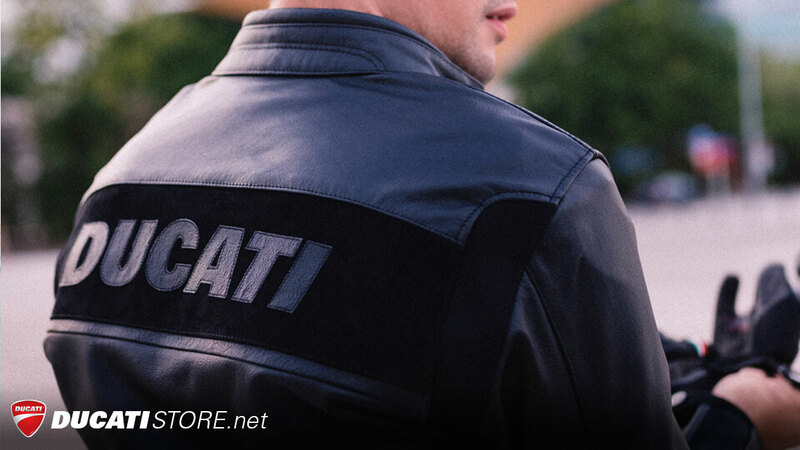 Accessories - already organised in the Sport and Touring packages and also available individually - sharpen the sporting spirit or touring aptitude of the bike. 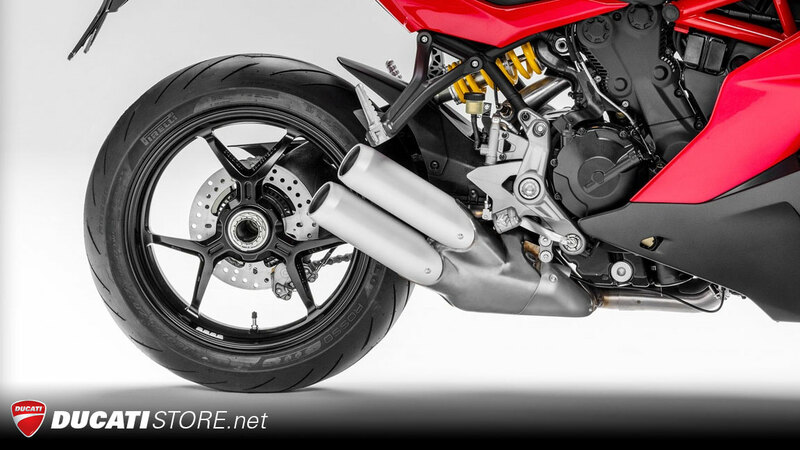 The Sport package includes a type-approved silencer and a complete Ducati Performance racing exhaust system by Akrapovič. Touring accessories, instead, include semi-rigid panniers, an enhanced-protection screen, tank bags and other luggage items plus a selection of seats with different heights. The SuperSport incorporates the very latest innovative Ducati technologies, including the famous Ducati branded Riding Modes. The three Riding Modes (URBAN, TOURING, SPORT) are enabled by combining class-leading technologies such as: Ride-by-Wire (RbW), Ducati Traction Control (DTC), multi-calibration 9MP ABS and the graphics on the instrument panel. The rider can change the character of the bike by selecting from the left-hand switchgear - even while riding - among three different pre-set configurations (Riding Modes) that best adapt to the riding style or riding conditions. The Riding Modes make it possible to instantly modify the power delivered by the engine (RbW), the activation levels of DTC and ABS, and the graphics on the instrument panel The Riding Modes are factory pre-set in each of the three parameters, but can be individually customised and saved to suit the rider. A ""default""option is available to easily return all settings to factory pre-sets. On the SuperSport, the Testastretta 11° engine features crankcase and cylinder heads that have been redesigned to make the power unit an integral part of the frame; further modifications include re-routing of the water through the heads and a specifically designed alternator cover to allow installation of the new gear sensor. Large 53 mm throttle bodies - smoothly controlled by the full Ride-by-Wire system - allow the engine to gulp in the air-fuel mix. Moreover, this engine also features unprecedented control and injection systems. Engine power is transmitted via a 6-speed gearbox with a new gear sensor. 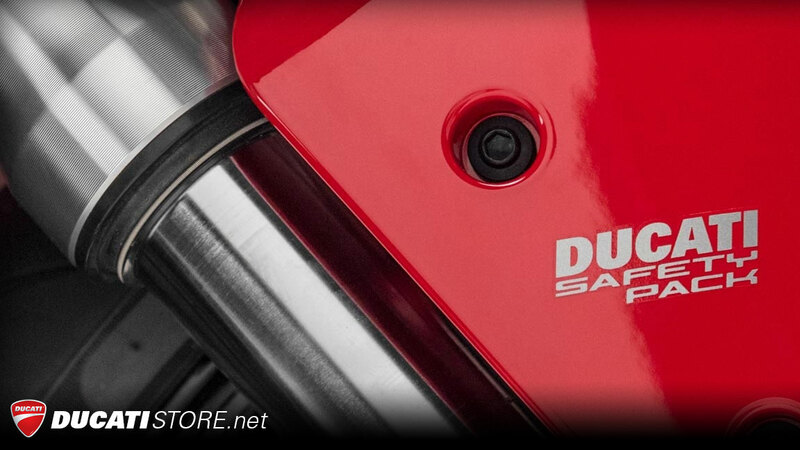 This means bikes in the SuperSport range can be equipped with the cutting-edge Ducati Quick Shift (DQS) up/down unit, offered as standard on the SuperSport S series and available as an accessory for the SuperSport. Featuring low-effort wire control, the clutch is of the oil-bath slipper type. The anti-patter function cuts in when the rear wheel exerts back-torque, reducing pressure on the discs to ensure vehicle stability during the aggressive downshifting typical of competitive riding. The Ride-by-Wire (RbW) system is an electronic interface between the twistgrip and engine, which configures an ideal power response depending on the riding mode selected. The twistgrip does not have a throttle cable connected directly to the throttle body butterflies, but instead delivers a signal to a control unit, which in turn operates an electronically controlled butterfly. The SuperSport braking system is, in terms of technical content and visual impact, very similar to those seen on the highest performance sports models. At the front, radial monobloc Brembo M4-32 calipers - powered by a Brembo PR18/19 radial pump with separate reservoir and adjustable lever - squeeze two 320 mm discs. At the rear the SuperSport has a 245 mm disc gripped by a 2-piston Brembo caliper. 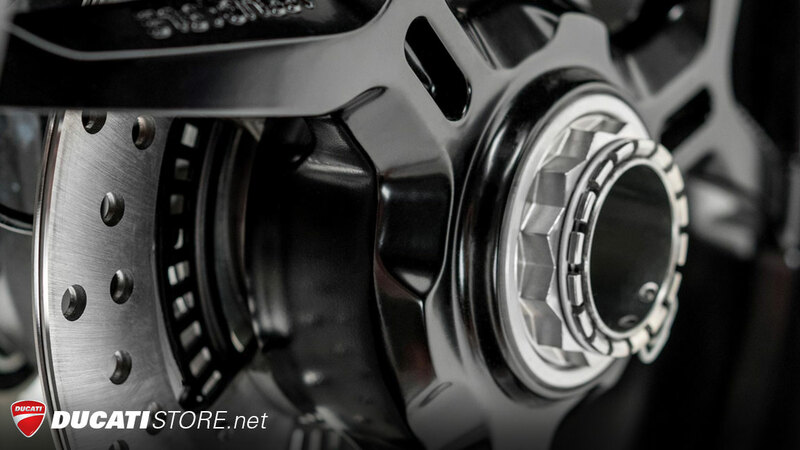 The Brembo system offers powerful braking with excellent linearity between the applied force and actual braking. This translates into ready responsiveness, giving first-rate ‘fingertip feel'. The braking system is controlled by the Bosch 9MP ABS system with 3 mappings. The wheels mount the new Pirelli Diablo Rosso III tyres, 120/70 ZR 17 at the front and 180/55 ZR 17 at the rear. The Pirelli Diablo Rosso III - the direct successor of the Diablo Rosso II - gives even better sports handling and grip, raising road tyre performance to unprecedented levels. The Diablo Rosso III features new profiles, latest-generation materials, innovative construction, new compounds and a tread pattern that stems directly from the Diablo Supercorsa, ensuring maximum yet long-lasting performance in terms of safety, consistent response and grip (also in the wet). The 3.5x17 front wheel and 5,5x17 rear wheel are fitted, respectively, with 120/70 ZR and 190/55 ZR Pirelli Diablo Rosso III tyres. The new SuperSport features a racing derived frame structure that uses the engine as a stressed element. This structure is composed by a compact Ducati trellis directly fixed to the cylinder heads and by the engine itself; the shock-absorber and the rear sub-frame are also connected to the engine. The sub-frame is a classic tubular layout, however, it is enhanced by a unique coupling between the tubes, plastics and tail light. This sophisticated frame structure is lightweight and stiff, allowing the Monster to achieve the lowest curb weight in its category (109Kg/463lb). Extreme attentiveness to the ergonomic triangle, aerodynamic protection and the rider's freedom of movement has resulted in comfort, versatility and jaw-dropping sports handling. The rider zone of the one-piece seat is just 810 mm off the ground, allowing feet to be placed firmly on the ground. Handlebar height does not place undue strain on the wrists and foot peg positioning prevents knees becoming tired while maximising control. The height-adjustable Plexiglas screen can be set to two different positions over 50 mm of travel, ensuring adequate airflow protection even at motorway speeds; enhanced protection can be had by fitting the larger Plexiglas touring screen, available as an accessory. Comfortably separated rider and passenger footpegs and a snugly compact lateral silencer ensure maximum freedom of movement. 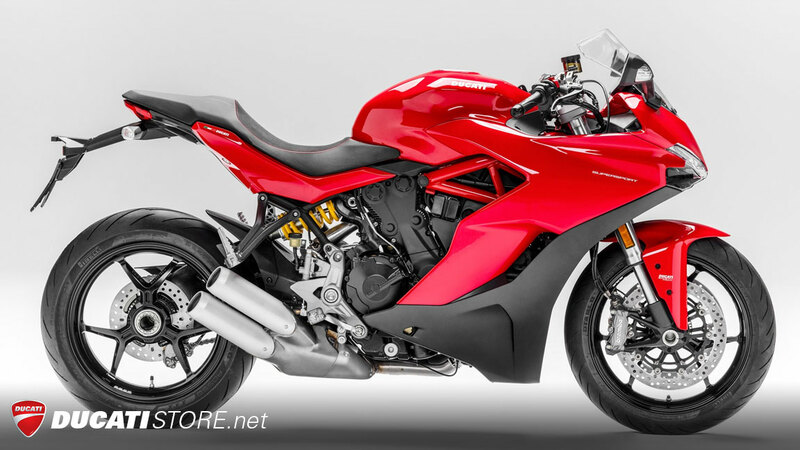 Like all true Ducati sports bikes, the SuperSport features adjustable suspension and a single-sided die cast swingarm that is light yet extremely rigid, giving the bike a decidedly technical, pro look. Up front we have 43 mm Marzocchi forks with fully adjustable damping and pre-load. The rear features a Sachs monoshock - attached to the vertical cylinder at one end and the swingarm at the other - which allows for adjustment of spring pre-load and rebound damping. The display gives information about speed, rpm. totaliser, trip1 and trip2, engine cooling liquid temperature, ambient temperature, clock and gear engaged. In addition, it displays present fuel leve, fuel consumption, average fuel consumption, average speed and duration of trip. The DOT-Matrix area permanently displays the Riding Mode selected and the corresponding ABS and DTC levels set. Ducati branded DTC offers a choice of eight profiles, or ‘sensitivity levels', each one programmed with a wheel-spin tolerance matched to progressive levels of riding skill, graded from one to eight. Pre-selected levels of intervention are related to appropriate Riding Modes. When DTC is activated, its ECU analyses data sent from front and rear wheel speed sensors to detect the amount of wheel-spin and to evaluate the type of intervention necessary. This intervention is executed in a very smooth way through electronic retardation of the ignition to reduce the engine's torque, until the full grip of the rear wheel has been re-established. DTC can also be deactivated if the rider wishes. DTC levels are factory pre-set in each of the three Riding Modes, but can be individually customised and saved to suit the rider. A default option is available to easily return all settings to factory pre-sets. 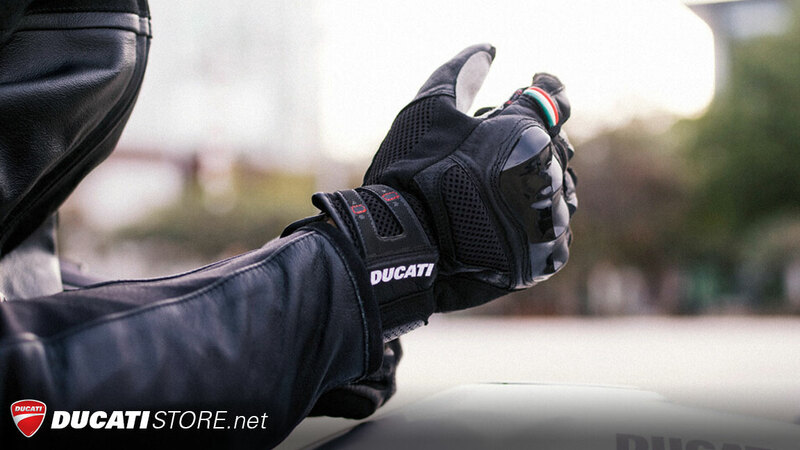 Ducati Quick Shift (DQS) up/down is a race-derived electronic system that lets riders up-change and down-change without using the clutch and without having to close the throttle to move up a gear. It consists of a two-way microswitch built into the linkage of the gear change lever; when actuated, it sends a signal to the ECU. The system works differently for upshifts and downshifts, integrating adjustment of spark advance and injection during upshifts with an auto-blipper function during downshifts. Extent and duration of system operation are designed to ensure seamless gear meshing under all ride conditions; during downshifts the system works in concert with the slipper clutch. Because upshifts can be made under full acceleration without using the clutch, precious fractions of a second that would otherwise be wasted in closing the throttle are gained: moreover, stability is improved as power delivery is absent for less time. Clutchless downshifting allows smooth gear engagement, letting riders focus their attention on braking and corner entry. This system not only enhances the thrill of sports riding: it also lends a welcome hand in city traffic or on winding roads requiring frequent gear changes. Ducati Quick Shift (DQS) up/down comes as standard on the SuperSport S and is available as a an accessory on the SuperSport. 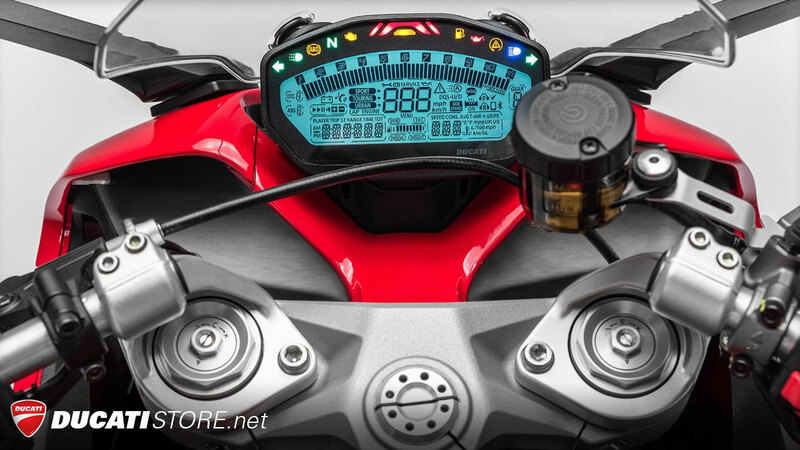 The control panel is set up to display information relative to the Ducati Multimedia System (DMS), available in the Ducati Performance accessories catalogue. The perfect blend of design and technology on the SuperSport is evident in the headlight, which uses low and high beam bulbs and Daytime Running Light (DRL) technology for the side lights. Get in touch with us today to arrange a test ride, enquire about financing, or learn more about the new SuperSport. 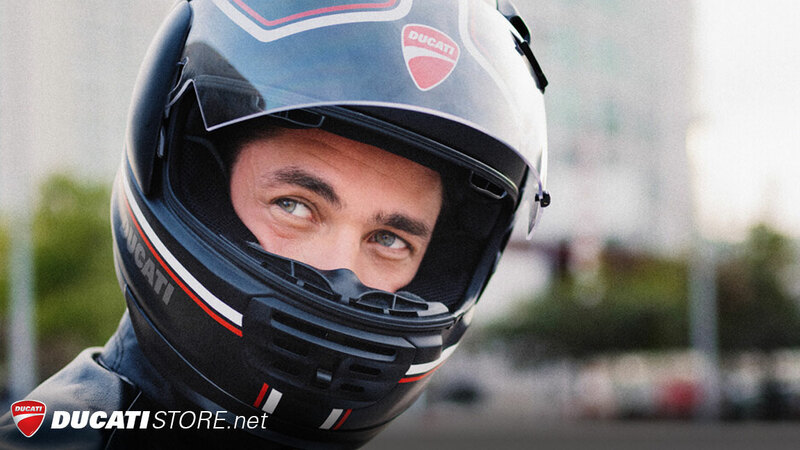 We offer a range of affordable finance options on new & used Ducati motorcycles. 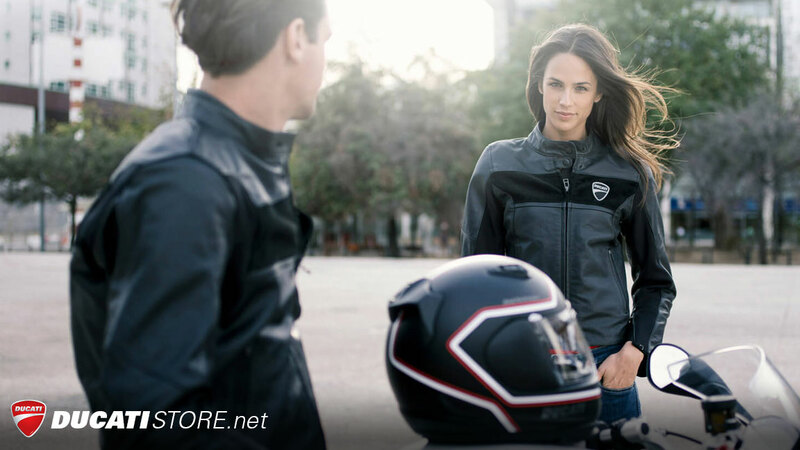 Parts and Accessories designed specifically for your SuperSport.